While other branches of the British army have corporals and lance-corporals among their non-commissioned officers, artillery units have bombardiers and lance-bombardiers. As an NCO rank, bombardier is pronounced ˌbɒmbəˈdɪə. A company called Bombardier is in the news at the moment. 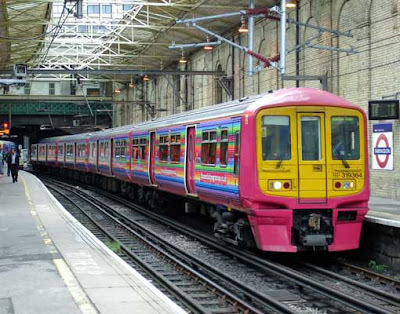 They are “Britain’s last train makers”, but have just failed to win a contract to build new trains for Thameslink. As those of you in the UK may have noticed, the newsreaders use a different pronunciation for the name of the company. They call it bɒmˈbɑːdieɪ or something similar. They are correct to do so. The reason is that — despite its supposed Britishness and its manufacturing works in Derby — Bombardier Inc. is actually a Canadian conglomerate, named after its founder Joseph-Armand Bombardier, a Québécois. He was the inventor of the snowmobile. In French his name is pronounced bɔ̃baʁdje, so the English name of the company is an anglicized version of this. The second syllable of bombardier is peculiar for often featuring a non-rhotic schwa even in rhotic accents: /bɑmbəˈdɪər/. In the US, the company's name gets the same pronunciation as the common noun. Come to think of it, what do anglophone Canadians use? I've always said ˌbɒməˈdɪə. I'd no idea that the second b was pronounced, having never heard it actually said. Chris Rogers was joking about this yesterday on the news channel. Duchesse: please remember that the readership of this blog is international. If you mean the UK TV BBC News Channel, say so. "The second syllable of bombardier is peculiar for often featuring a non-rhotic schwa even in rhotic accents: /bɑmbəˈdɪər/." Yes. In fact, the American who pronounced the words for LPD pronounced bombardier that way. I first came across this word in Spike Milligan's war diaries. My first thoughts were that it was either as described above, or like the verb 'bombard' with an extra syllable. I probably would have betted on the former, but didn't take the risk until I'd heard it pronounced. I wouldn't be surprised to hear it pronounced in the second way, though. There's a British beer called bombardier. I wonder how it's pronounced in the pubs. How would you describe it? A tongue-in-cheek presentation of the old-fashioned gallant officer image? Ironically officer-class? Note the old-fashioned exclamations 'yowzer' and 'huzzah'. The only reason I'm familiar with the beer is that I once new a couple of guys who were quite taken with the name and used to cry 'bombardier!' in a put-on posh accent in the style of a hunting call. The phonetic point I'm getting at is that the pronunciation of bombardier, besides the military connotations of the word, could have been integral to the choice to develop such an image - it looks like it might go like 'bombard', but it doesn't, therefore it's got an 'odd' (dare I say 'posh'? at least 'fancy') pronunciation. The Peter Collin Dictionary of Military Terms gives the pronunciation bɒmbə'di:ə. I'm sure they checked with at least one British Army informant. It's possible that they didn't check with a USAF informant, though. I was surprised to learn that while in the British Army bombardier (written Bdr) is an NCO rank, in the US it denotes a bomb-aimer in an aircraft. djbcjk's pronunciation might be what the USAF say. Or Peter Collins may be reflecting the careful speech pronunciation in the British Army — as opposed to the mode of speech that reduces sergeant major to a monosyllable. While an actual old-style officer might pronounce it with the STRUT vowel. The beer is usually pronounced ˌbɒmbəˈdɪə (or ˌbɔmbɹ̩ˈdiɹ in my rhotic accent - with the postvocalic R as usual, which I think was there even before I started thinking about it), although I remember hearing it pronounced bɒmˈbɑːdieɪ a few years back, possibly in jest. Got ya moving like an army wit ya hand inna di rear"
The Bombardier character in the ads is based on Lord Flashheart, Rik Mayall's character in various series of Blackadder. We often have Bombardier in our club bar and we generally pronounce it ˌbɒmbəˈdɪə but occasionally (in jest) bɒmˈbɑːdieɪ. I first heard of this company when I moved to Chicago for graduate school and read the name inside the cars of the commuter trains. I naturally assumed that it was pronounced like its English homograph, but one of my fellow students was a bilingual Canadian who soon set me straight! Oh. I thought it was evident I was talking about BBC News – I know of only one newsreader called Chris Rogers. But, yes, there is a possibility of there being several with that name. David Crosbie, does that dictionary actually use the IPA? It does indeed. There's no key offered to the symbols, presumably because Peter Collins dictionaries are aimed at an international market. In addition to the monolingual dictionary, I have a bilingual Polish edition. It uses the same transcription, again without a key. Their choice of symbols, including length marks, are largely identical with John's use (for RP) in the LPD. Bombardier shows one exception: they use i:ə where John has ɪə. There is no attempt to indicate American pronunciation. Definitions are written in simple English,making them easily accessible to anyone with a basic knowledge of the language, and phonetic symbols are used to show the correct pronunciation. Having written all this, I now see that I could have simple posted this link, which allows you to,look inside the book. That Dictionary of Military Terms sounds interesting. What do they say about glacis? That word appears in the song 'The British Grenadiers' and we were all pretty much stumped by it in our choir. Etymology: < French glacis (first recorded in the 16th cent. ), originally ‘a place made slipperie by wet lately fallen and frozen on’ (Cotgrave), and related to Old French glacier to slip, slide (see glace v.). In medieval Latin (c1270) glatia is found with the meaning of glacis (in fortification). 2. a. Fortification. ‘The parapet of the covered way extended in a long slope to meet the natural surface of the ground, so that every part of it shall be swept by the fire of the ramparts’ (G. E. Voyle Mil. Dict.). 1955 Times 3 Aug. 9/2 This view of east Germany as part of Russia's defensive glacis has never been dropped. 1960 Observer 7 Feb. 7/6 The countries of Eastern Europe‥form the glacis between the Soviet Union and the West. wow - your follow-up post concerning the newsreader displays even more arrogance than your first!! How anyone outside the BBC-watching UK readership (which is not even all the UK readership) is going to have heard of this newsreader is beyond me! I see that it would have been helpful for the point of the comment to indicate whether it was in a UK or another news channel, but a quick Google or Wikipedia check would have given you the answer in no time. As an anglophone Canadian, I have only ever heard [bɑmˈbɑrdjeɪ] in reference to the company. They're in the news a lot in this country. When the word refers to the snow bus made by the same company, (like the one shown in John's blog), it's often called a [ˌbɑmbəˈdir]. "Layoffs announced today at [bɑmˈbɑrdjeɪ]"
"They set off over the hills of snow in their [ˌbɑmbəˈdir]"
Precisely. I am appalled at the reaction and the outrage. It's outrageous. Rudeness? Sarcasm? Arrogance? ... Furthermore, people outside the Kingdom might have heard about him since he is sometimes on BBC World News. Thank you, David, for all the information! A Google search for "Chris Rogers" doesn't display any mention of a newsreader on the first page. I'm outraged by your outrage. Can we stop now? This gentleman who is, according to his Wikipedia article, an "occasional relief presenter on the BBC News Channel", surely doesn't warrant such attention. vp, given that "Chris Rogers" looks like a name several people might go under, I'd have added news or "news channel", which gets you the right one right on top. Steve: I don't subscribe, but from memory a letter from Lt-Colonel RuddilyOutraged ( retd. ) demanding why oh why the newsreaders are using the continental pronunciation instead of our Great British One. Or something like that: asked and answered in this blog, clearly, so I was hoping John Wells would write in and settle things.